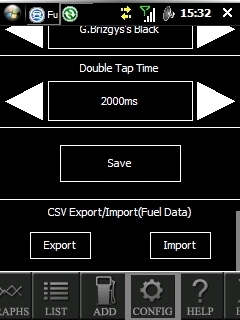 This is a little program for tracking your fuel consumption. ATTENTION! Please install v0.9.1.1 first, if you are upgrading from any version lower than v0.9.1.1! -Change: Renamed the "FuelData.sdf" to "FuelDataV0911.sdf"
-Fix: Due to a bug in Visual Studio 2008 all Icon files were the same in the cab. -Enhancement: Completely redesigned User Interface -> Now even more fingerfriendly! 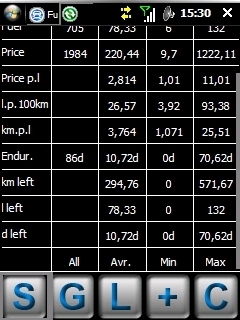 -Own Tabs for Graph/Stats etc. -Feature: Option added to allow the total odometer value be entered. 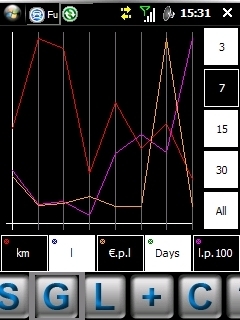 -Fix: Fixed a bug that the graph doesnt fit on the width of the window. -Fix: Statistics were wrong according to a wrong counter. 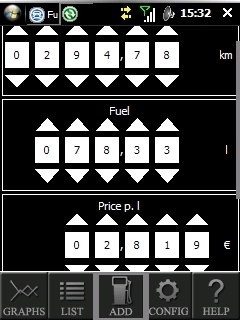 -Feature: Now the time is calculated you use the tool and how long last your fuel in days.